Danish Army Specific: Late 1991 the M70-series was chosen to replace the M247, M255 etc. 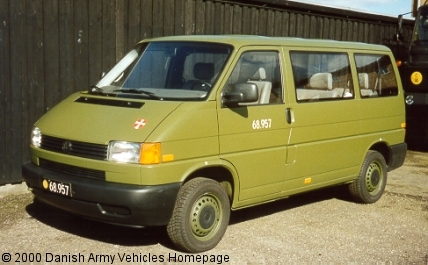 It was tested from 2nd of January to 28th of February 1991 in competition with FIAT Ducato, Ford Transit and Peugeot J5. The testing was carried out in conjunction with the Material Commands of the Navy and Air Force. A second trial phase was carried out in October 2000. This time the T4 competed with vehicles from Mercedes and IVECO, and once again VW was chosen to deliver buses and pick-ups. Historical: Prototyped in 1985 with production start in June 1990. With this model the engine was re-located to the front. 4- and 5-cylinder petrol- end diesel-engines, were available.The diesel-engines were known from the VW Passat and Audi 100 range. 5-speed gear boxes became standard in the range. Length: 4.65 m (181 inches). Width: 1.84 m (72 inches). Height: 1.94 m (75 inches). Weight: 2.550 kg (5.610 lb.). Engine: Own 5-cylinder, 2.370 cm3 (144 cubic inches), liquid-cooled. Horsepower: 78 at 3.700 rpm. Fuel capacity: 80 liter (17 gallons). Range: 550 km (343 miles).